Jellyfish are a kind inverterbrate animal that live in the ocean. Despite having 'fish' in their name, Jellyfish are not actually fish, they are members of the phylum Cnidaria, along with corals, hydras, and sea anemones, and the class Scyphozoa. To avoid confusion, they have also been called 'Sea Jellies'. or just 'Jellies'. Jellyfish are often consumed in Asian countries, especially dried and reconstituted. Jellyfish salad is considered a Vietnamese delicacy. Jellyfish can survive in oxygen-poor water because they have a symbiotic relationship with algae, which produce oxygen inside the jellyfish. Jellyfish have sharp stingers in their tentacles that have stingers to catch food, or for defensive purposes. For this reason they are sometimes called sea wasps or sea bees. Jellyfish are found off the coast of every continent in the world except Antarctica. Jellyfish have been known to kill humans. 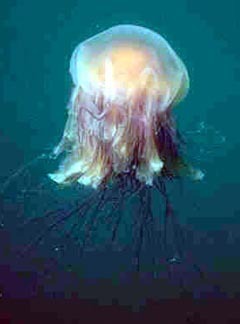 Species of jellyfish include the Sea Nettle Jellyfish, Flower Hat Jelly, and the Blow Jelly. The most deadly animal currently known is the diminutive "box jellyfish" of Australia, or "irukandji". In 1965, the film The Sting of Death (a reference to 1 Corinthians 15:56) was released, documenting in dramatic fashion the life and death of jellyfish in the ocean. Perhaps one of the most remarkable features about jellyfish is just how delicate they are with no skeletal structure, especially considering how deadly they are. In fact, 95% of the jellyfish's body consists of water. A jellyfish does not have a brain or a central nervous system, nor does it have a circulatory system or blood. This page was last modified on 21 July 2016, at 11:05. This page has been accessed 8,285 times.